If I asked the question, “What would you consider a mathematical space?”, very likely most people would say “math class”. To get more varied responses, one might consider asking a more open question, such as “Can you think of a time when you use math regularly?” For me, I feel that everything is a mathematical space. When I see a great work of engineering, such as the Arc de Triomphe, or the Vatican, or the Kremlin, often times I find myself considering the logistics of construction, how many hours of skilled labor such a work took to complete, and so on, but I doubt many people think in the same way. As teachers of math we need to think of how math is taught and applied, and how we can show that mathematical knowledge can give people an extra modicum of control of the world around them. I found myself furrowing my brow the other day while sitting in a class catering to prospective mathematics educators. A fellow student very bluntly declared “Arithmetic isn’t math.” There wasn’t necessarily a resounding agreement across the class, but there certainly seemed to be a number of other students nodding their head in consensus. I on the other hand, would strongly disagree. Arithmetic is not only math, but it is the most accessible, and personally impactful type of math that the overwhelming majority of people will encounter in their lives. So in what space do we use addition, subtraction, multiplication, and division? Probably the biggest is managing our finances. Student loans and interest rates are very real and relevant issues for young adults, particularly in the current political climate, and the risks of falling into debilitating debt is of no small consequence. With plenty of credit card interest rates above 20%, and the spreading epidemic of payday loans – an understanding of how basic finances work is an absolute must for all citizens. But I digress, finance is a subject which fills dissertations and the takeaway should be that learning how to manage money is of monumental importance, but not within the scope of this writing. So how does the world use math? Let’s explore a few topics in mathematics and how they apply to daily life, in pseudo-descending order of difficulty. Number Theory gives us many ways to manipulate equations to simplify operations, and continuing fractions are really cool, but most importantly, it turns out integers cannot be factored in polynomial time. This means that even very, very expensive computers (ones funded by entire countries) cannot break down numbers used to encode information sent over the internet. This simple mathematical fact is what the world of internet security hinges on! How does this affect a normal person? It doesn’t in a way that a consumer has power over, let’s move on. Calculus, obviously everyone’s favorite subject. Without calculus, how could I calculate how long it’s going to take my 37 degree drink to reach the 70 degree room temperature? In Fahrenheit of course, because why would America use a system that makes sense? Ok, so maybe that’s not very practical, but physicists, engineers and tradesmen alike use thermodynamics across multitudes of fields. Heat transfer properties are particularly important for metallurgy. How can a normal person use calculus? Well if you’re not population modeling your pet rats, maybe you’d like to know how your analog thermometer works? No? Fine. Boolean algebra is a subset of algebra in which variables are given the value of true or false. DeMorgan’s laws falls within boolean algebra and can be used to transforms logical statements into alternative, equivalent forms. Computer programmers use these often when coding. So how about a non-programmer? Nope, let’s keep going. How about statistics? Even high school students have seen statistics content on some level, even if it’s just a picture of a bell curve. Undergraduate students studying linear algebra will at some point, study linear regression. Some may even have the pleasure of writing regression equations by hand (fun fact: it’s not fun). Linear regression takes a number of data points (usually a huge sample), and attempts to best fit a line through them to determine a trend. Many research papers studied at the graduate level will include linear regressions in attempts to prove or disprove a hypothesis. Understanding how it works gives better understanding of the accuracy of the hypothesis. The importance of understanding statistics continues when research papers use standard deviation as well, which is often cited alongside the statements that use the data. Does this apply to “normal” people? Well, if you consider anyone who reads research articles ‘normal’, then yes, but majority of people? I doubt it. Let’s take a few more steps down, we’re almost there, I promise. ARITHMETIC! I told you we were almost here, and here we are. [Statistically] Everyone can do it, although if you just asked someone to do arithmetic they would probably not be very happy to. (As an important aside, never trust a math major to do arithmetic.) Generally and anecdotally speaking, the more proficient in higher concept mathematics one becomes, the more terrible they become at completing simple operations…in my own personal experience. Alright, so how does one use arithmetic daily? I already said we’re going to stay away from money, so I won’t go into how you’d save more money if your car used fewer gallons per mile (better than mpg for comparison), or that if you drive out of the way to save on gas you’re probably working for less than minimum wage. Instead, I’m going to show you how addition/subtraction, and inequalities can make you more cognizant of your health, and how a change of the smallest percentage can alter how people see and treat you. I would be willing to bet that the majority of people could answer this question: The FDA food labels are based on a “what” calorie diet? Go ahead. Think about it. Yeap, you’re right. The correct answer is 2,000. Subsequently, FDA food labels do involve some arithmetic because some jester at Pepperidge Farm claims there’s 5 servings of Milanos per package. FIVE! For normal people, there’s maybe two – at best. On this subject, I claim that New York’s calorie count law turns all restaurant chains into mathematical spaces, if they weren’t already. 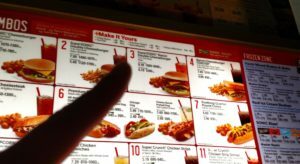 The law requires that restaurants with more than 15 locations to post the calorie content of their dishes in clear view. This has also developed into new food labeling that shows calories per serving and per container, such as on a bottle of Snapple tea and other popular drinks. So what can we do with this new information? Well, let’s read a hypothetical book by Neil deGrasse Tyson (2011): “A WeightLoss book written by Physicists would be 1 sentence long: “consume calories at a lower rate than your body burns them” . This is an obvious oversimplification of our biology, but that makes the statement no less poignant. If my hypothetical person can answer the 2,000 calories/day question, would they be able to answer the follow-up question: “What should people be eating? The least we should expect is that they have a very good idea of what not to eat. Enter the mathematical space, a.k.a. – every single one of the photos here. Yes, anywhere you buy food is a mathematical space. 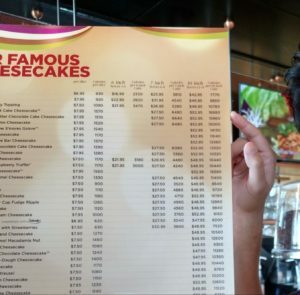 Now I love cheesecake as much as the next guy, and I’m going to eat it regardless of whether I should or not. Is posting how many calories are in it going to stop me from eating it? Not in the long run, but maybe I can skip it today and have some tomorrow…or next month. So what should we eat? I don’t know, and in fact, no one knows because the answer is too broad and individual needs too specific. Unless we go back to hunting-foraging in significantly lower population densities, humans are not likely to ever return to the diet that sustained us for tens of thousands of years (if it was even ‘healthy’). Since that isn’t going to happen, can we instead turn to what we want? Or what other people tell us we should have? A quick Google search leads us to “Best Diets 2015” by US News (2015). There are not 8 diets on that page, there are 8 categories of diets on that page. Okay, this seems a little ridiculous, maybe we can simplify the method? Let’s assume most people can figure out whether they are above or below “average” in how active they are. So instead of calorie counting and trying to figure out what we should eat (blatantly disregarding further research into specific ingredients that are “bad” for you), maybe we can use them as intended; a guideline. I don’t eat at KFC often, but for what I eat there, they seem to be the least serious offender out of my skewed sample of the three. 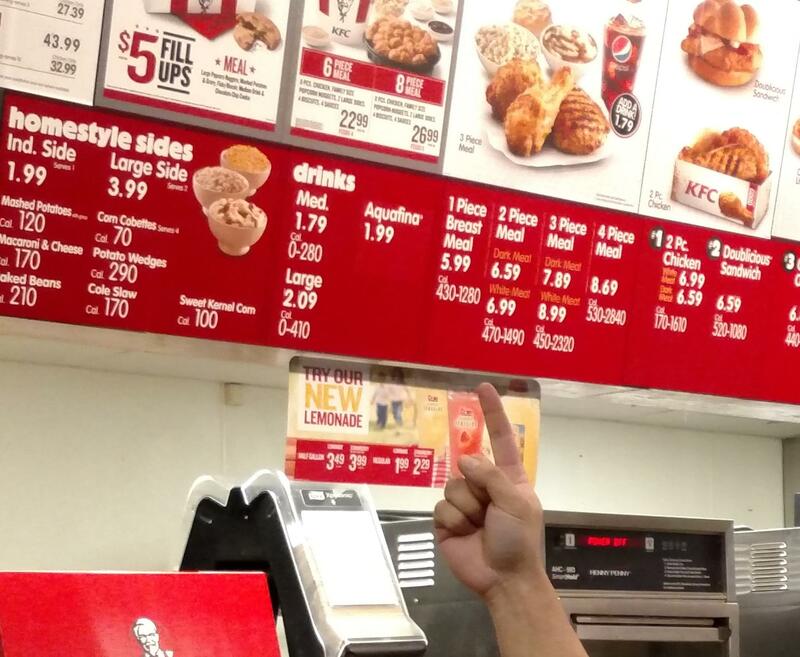 Say someone is in the mood for chicken, they go to KFC, and get a 2 piece meal. Wait, 470-1490 calories? Ok, so either this isn’t giving me enough calories for one of three meals, or it’s giving me so many I’m hardly allowed to eat for the rest of the day. Now we have to play the arithmetic game on what those side dishes and soda add up to. Better stick to buying things individually. Burgers, the quintessentially American food! Oh look, Sonic “America’s Drive In”! What could be better? My go-to anywhere is the bacon cheeseburger, because bacon, but 1590-1840 calories? Maybe I should just have a corn dog because I want to save room for dessert. 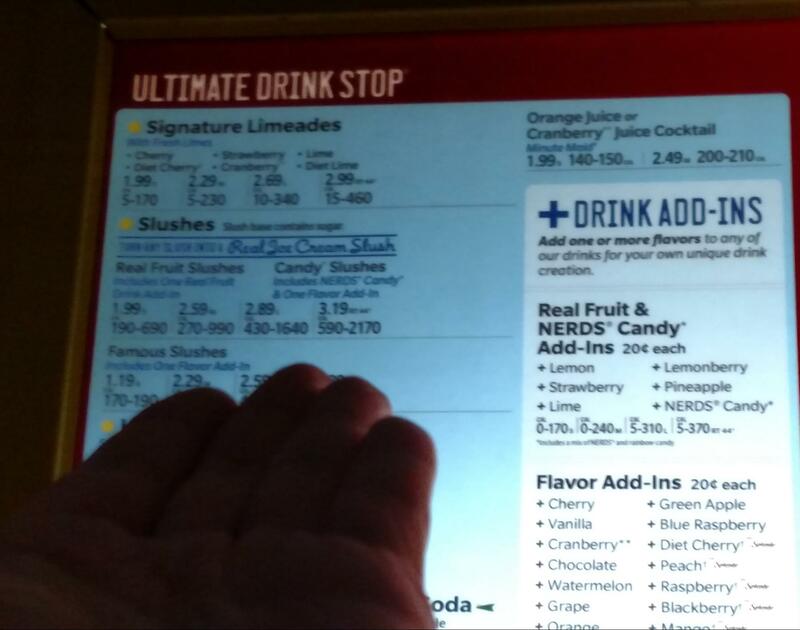 An extra large slush for 590-2170 calories? Well, I ate today, so that’s out the window. Guess I’ll put off having a slush for some other time (even the small can contain up to 690 calories). Maybe it was one of those days you just wanted to sit down at a restaurant and enjoy not cooking, cleaning or even getting up to get yourself another drink. You decided to go to The Cheesecake Factory because it’s been so long since you’ve had any cheesecake. You and your friends decide to eat very light foods to save room for dessert. Maybe you even skipped the food altogether because you couldn’t wait for delicious cheesecake. Well you’d better skip the rest of the day’s food too depending what you want, because just on what you can see of this list there are four options over 1500 calories! Including those four, there are 28 options over 1000 calories! Maybe you should order just one and split it between everyone, and make sure not to finish it. Well now that fiasco is over, how much do we leave for a tip? Which brings us to our next subject: tipping – more arithmetic, but this one is a bit more computational, as opposed to most of the other of the “Don’t-eat-this Inequalities”. So maybe the service wasn’t the best you’ve ever had, but it also wasn’t the worst. How much should you tip? Well they get paid hourly too, so do you really need to tip that much? Did you know that tipped employees are only required to be paid $2.13 an hour? Why does this matter? So I have already addressed that usage of higher level math is out of reach of most people, and that people can use arithmetic to help guide decisions that affects their physical health. Tipping is arithmetic you can use to affect how people view you as a person, and that is the truth. This fact is particularly important if you ever want to return to a restaurant or bar. Wait, what do you mean if I want to return? I worked at a TGI Fridays for about a year and if you think the tip that you left the last time (good or bad) goes unnoticed and unremembered, think again. Without going into the specifics of probability, say you’d like to go back to a restaurant you’ve been to before. The odds of you getting the same waiter are pretty slim unless you ask for them specifically, although the odds of them being there are pretty good if they are full time. If you go back a second time now you have two waiters who might remember you in the building. How did you tip those last two times? This is not a cautionary tale of the horror stories you hear about people doing things to your food before you eat it, but a simpler one of how you treat, and are treated by people. Tip someone well, and they will remember it. Tip someone poorly, and they will remember it well. Servers do not exist in a vacuum, and tell each other about their customers. So if you’re remembered for your tipping, your service and treatment (by all of the employees) may reflect that. Does it seem like you can’t ever flag anyone down for that drink refill? Did it look like the table that sat down after you got their food a little faster ? Has no one smiled at you since you walked in? Maybe they’re having an off day, or maybe they’re not the best employees, or just maybe you tipped poorly the last time you were there. Is your drink always full? Is your server constantly checking to see if your needs are met with a smile? Did you finish your meal and notice they “forgot” to charge you for soda? Maybe they’re being kind, or just maybe you tipped well the last time you were there. Which side of those odds do you want to play? That’s up to you, and whether tossing in or saving a few extra dollars or cents matters that much to you. For mathematicians, this part will be easy since this essay was written by and for math teachers, but bear with me, it’s not too much work. According to NY schools, teachers who “have a masters degree but no teaching experience will start at $60,704” (UFT Salary Schedule, 2017). Using more estimations for simplicity, let’s go straight to $800 a week after taxes (ADP Net Pay Calculator). Let’s assume you and 4 friends go out to eat for one hour, and the check is $30 per person. You could tip the average of 15%, toss down your $34.50 and call it a day. A good tip is generally considered 20% or more. Let’s not even look at that extra 5%, let’s look at just 1.7%. Maybe you don’t carry change and didn’t particularly care about the 50 cents, so you put in $35 even. What does that 50 cents mean to you versus them? That 50 cents is one sixteenth of one percent of your weekly salary! Now if your friends are like you, or are lead by your example, you just increased your server’s hourly wage by $2/hour ($80/week, $320/month, $4,160/year). That’s an Increase! On top of the 15% you are already giving them, and for only 50 cents, or 1.7% more. Now that is a huge assumption that they can continue to have similar customers paying similar amounts for pay, and the difficulty with food service is the inconsistency of customers, but we’ll stick to these numbers again, for simplicity’s sake. So by paying attention to some basic arithmetic, such as inequalities, sums, and percentages, a person has math to thank for such simple tools that help them to interpret and navigate their food choices, and dining habits. Dining-out calorie-awareness is new, but tipping is a cultural and “legal” precedent in the US. It is legal in the US for employers to pay less than minimum wage because their employees receive tips, and culturally, you know, or should know that servers’ livelihoods depends on those tips. So if you do not have enough money to tip, you probably should not be going out to eat. Both calorie arithmetic, and tip arithmetic have direct and immediate personal and social impacts. 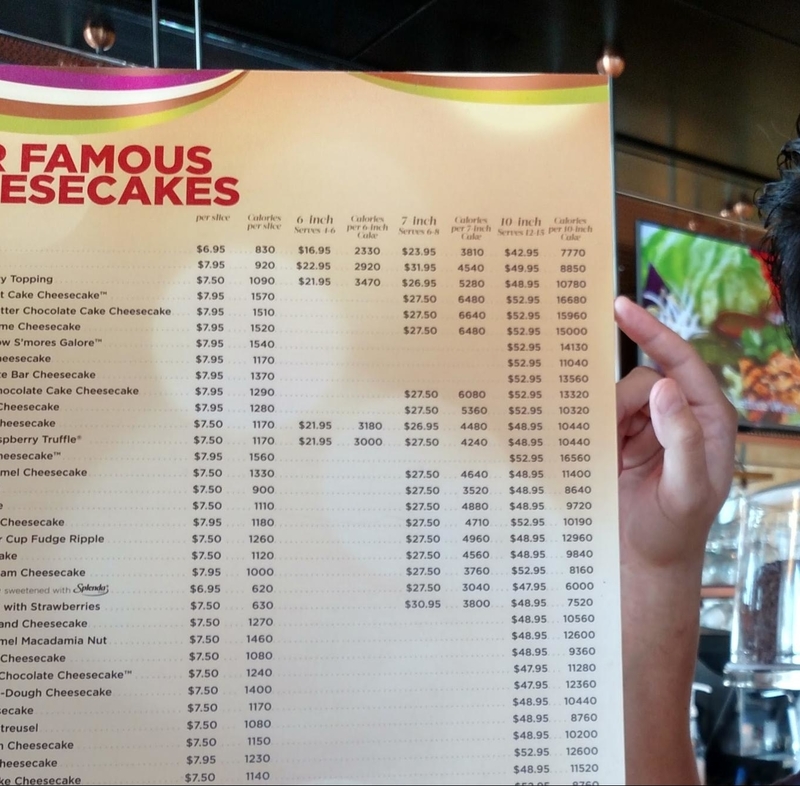 Want to eat cheesecake for every meal? You’re going to feel it. Not sure how to tip? You get what you pay for, and many times you will be treated accordingly. Not only do customer service employees judge you by your tipping habits, but others people do as well. The stereotyped math major (or anyone with good number sense) might not like the fact that their friends hand them the bill every time they go out to eat, but I quite enjoy it. If I am assertive, I can demand my friends tip more relative to what they had intended. If I am passive I can contribute more than I would have to make up for my friends who tip poorly, because I know how much it means to the server. If I am passive aggressive, I will compensate for my cheap friends and refuse politely to eat with them in the future. I have done all of these things, because when you tip poorly, you are cheap at best (no, not frugal), and apathetic, inconsiderate, rude and ignorant at worst.